This year is the year of premium cabin mistake fares for me. I recently got the chance to take advantage of an awesome mistake fare from Los Angeles (LAX) to Shanghai (PVG) via Hong Kong (HKG) on Hong Kong Airlines in business class for $540. I paid for my trip with the Chase Sapphire Reserve card, which enabled me to earn 3x the points on travel. I earned 1,620 Chase Sapphire Rewards points worth approximately $33. Paying with the Chase Sapphire Reserve also covers me with a little bit of additional travel protection should anything have gone wrong. Hong Kong Airlines has been around since 2001, but long haul flights started for them not too long ago. The Los Angeles to Hong Kong market is pretty saturated with 3 airlines flying up to 5 flights per day. I was curious to see how Hong Kong Airlines product was. I received an email to check-in online but unfortunately it wouldn’t actually allow me to check in. When I arrived to the Tom Bradley International Terminal (TBIT) at Los Angeles (LAX) it was packed. Hong Kong Airlines economy check-in line was over flowing from the queue all the way down to the door. Thankfully the Business class line only had 2 other people in front of me. I was through check-in in about 15 minutes. The agent gave me both boarding passes along with a lounge pass and this awesome card acknowledging the mistake fare. While cheeky, good on them for honoring a mistake fare, they deserve all the PR for it. 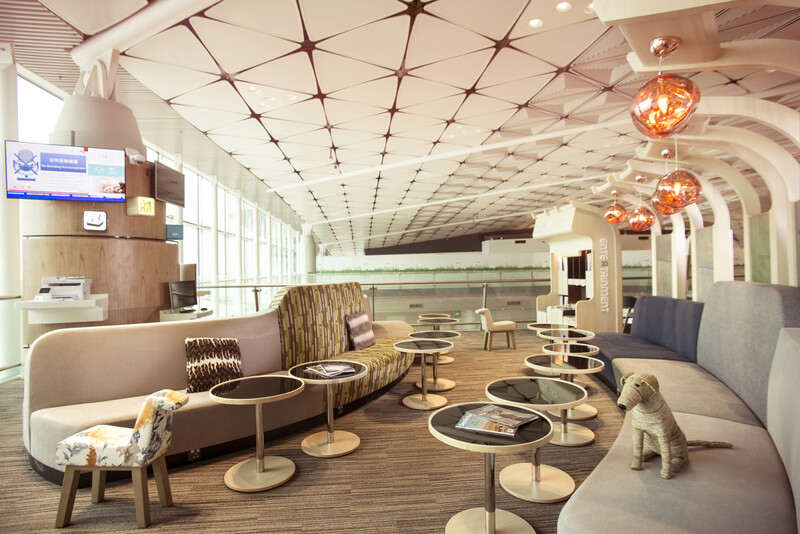 In Los Angeles Hong Kong Airlines uses the Los Angeles International Lounge. It overlooks the terminal but the food and beverage options were limited. The only thing that was good about the lounge was that it was a quite space. In Hong Kong there are 2 lounges you can access. 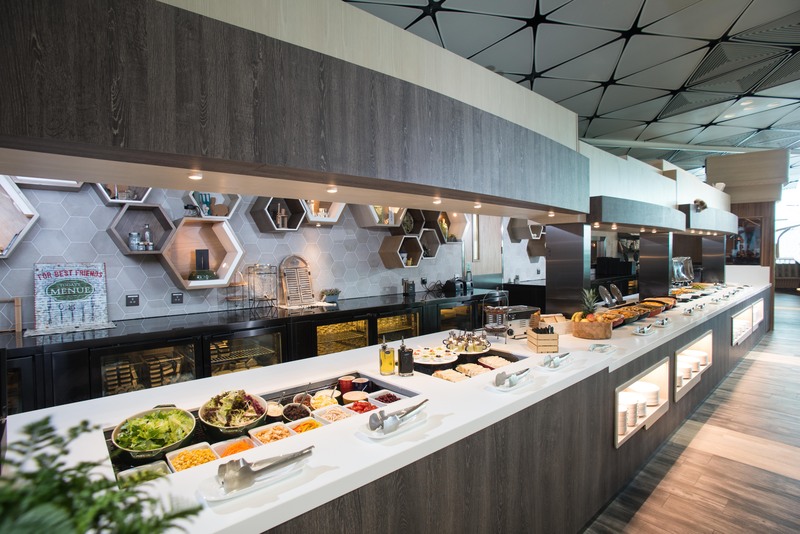 The Club Bauhinia is by gate 23 while the Club Autus lounge located in the 200 gates. I would skip the Club Bauhinia as the Club Autus lounge is much larger with a larger selection of food and beverage. The food selection at Club Autus included some food to order stations too, but it was pretty packed. In Shanghai they contract to the No.77 lounge. In addition to hosting over a dozen airlines it is accessible via American Express Platinum and Priority Pass. There is a walk up bar and a decent selection of food. There were lots of seating options and the lounge was pretty empty when I was there. Not too memorable but still nice to have. The seat was actually my favorite because of how wide it was. I chose seat 12K located in the bulkhead on the far side of the plane. The window seats (All A and K seats) in this configuration are the most comfortable. Hong Kong Airlines made the decision to cushion the empty space between the window. Center seats don’t have the wide seat luxury and are exposed to the aisle. For my return I was onboard 1 of 2 A350’s with new zodiac reverse herringbone seats (B-LGE). While these felt more modern and private they also felt significantly more cramped. The few places where these seats thrived was the ample storage space and each seat had individual air nozzles. Waiting at each seat on boarding was a great pillow and a comfortable blanket. There was also some pretty low quality noise canceling headphones. Before departure flight attendants came around with amenity kits. They were designed by Ricebowl Republic and had fantastic design. Each kit contained socks, an eyeshade, a toothbrush and toothpaste, earplugs, and l’Occitane branded moisturizer and lip balm. On all my flights the in-flight entertainment was super responsive. There was a fair amount of new movie options along with old classics. It wouldn’t be a bad idea to bring some movies of your own as well to supplement. There was a significant section dedicated towards foreign and Chinese films as well. On my first 3 flights the screen is older and on the smaller side. That being said the planes were delivered in August 2017 so quality wasn’t bad, just small. On the last flight with the reverse herringbone seats, the in-flight entertainment was over designed to the max. The screens were really large but what was interesting is that you could watch a movie from 4” handset while playing something else on the main screen. A feature no one ever asked for or needed. You could also use the handset as a virtual mouse on the main screen which sounded better in concept than in execution. The food on all the flights was very hit or miss, and if they missed, they missed by a lot. On my first flight from LAX-HKG the food was probably the worst. Service started with appetizers that included lobster, abalone and a side salad. Next came a very traditional pork soup. For the main course I went for the western option, which ended up being chicken stuffed with cheese. It wasn’t the most appetizing looking and ate very over cooked and greasy. The second meal was pork with a fried egg, which was much much better. They also had a selection of foods on demand including dim sum, which was tasty. On the flight from HKG-PVG I was served dinner even though we departed after 9 PM. I made the same mistake again by picking the western option. I was served an anemic piece of beef along with 2 different kinds of potatoes. From PVG-HKG I flew in the morning. The breakfast was among one of the better meals. Service on the 2.5-hour flight started with fruit, yogurt, and a muffin. The main course was an omelet with pork loin and vegetables. I absolutely loved their mug design; oddly these were only used on my short flights instead of the longer ones. My last flight from HKG-LAX started off with a tasty fig and ricotta salad. I finally learned my lesson and had the stir-fried chicken option, which was excellent. The one place that Hong Kong Airlines really exceeded my expectations was with their beverages. They have an extensive list of delicious teas. On all of my flights the flight attendants did a fantastic job. I always felt welcome and warm. The lavatories were kept tidy. Have you flown with Hong Kong Airlines? I love that amenity kit, how beautiful. I like when an airline does something special like have interesting plates (KLM) or amenity kits as in this case. Did they have vegetarian or fish options on the menu e.g. there were several main course options, or was it straight up Western v Asian menu? There were 3 options on the long haul flights with 1 vegetarian, 1 asian, and 1 western. I still have the menu’s at my house. Ill try to update with photos when I am home next week. I have a flight booked on hongkong airlines next month to PVG then JAL to India from there. I know I’m eligible for the transit visa on arrival at PVG but since I’m flying on two separate tickets, will they give me any hard time from SFO without a China visa?